The Model 691 SP stump and root grinder from Doskocil Industries offers a 18-20 HP Kohler gas powered 2600 R.P.M. engine for sturdy, reliable operation. 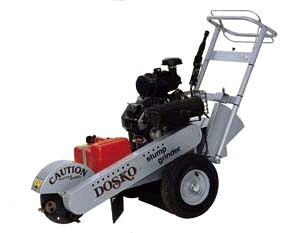 Unlike grinders that use 12 to 18 teeth, Doscko stump grinders use only eight carbide-tipped teeth. With a 14" diameter cutter wheel and 4V Power Band drive belts, the unit has a cutting capacity of 20" above grade and 16" below grade. 20HP Kohler Elec. Engine, Dosko Stumper, 14" Cutting Wheel, 8 Carbide Teeth, Towable, 20" Above Ground Cutting Capacity, 16" Below Grade Cutting Capacity, 400 lbs., Width = 34", Length = 51", Height = 32"
A specially designed wheel brake locks one wheel while grinding and allows the other wheel to rotate freely, giving the operator the back and forth movement needed for grinding jobs and the ability to hold the machine stationery for added safety and control. For operator comfort, spring-locking handle bar adjusts to six positions. NARROW WIDTH OF MACHINE, TIRE TO TIRE IS ABOUT 34 INCHES. * Please call us for any questions on our stump grinder 20hp/32 inch w serving Honolulu, Waikiki and surrounding communities on Oahu.